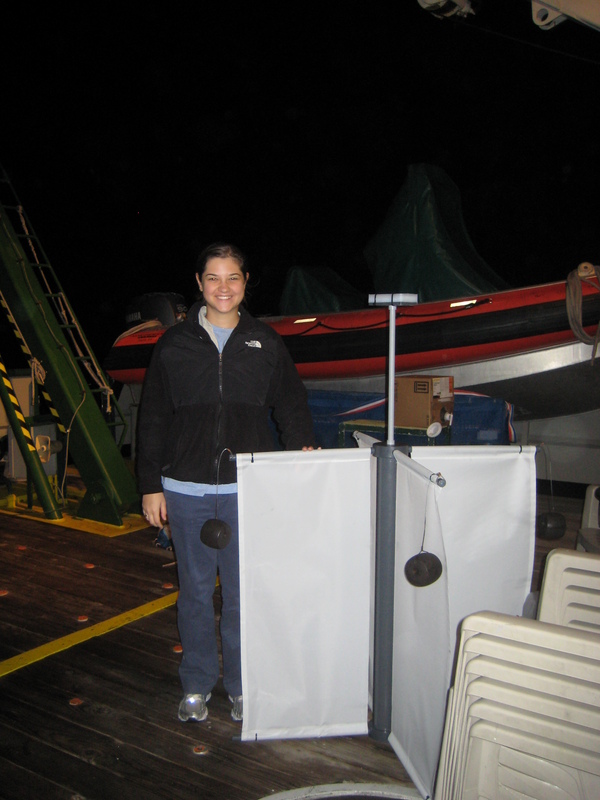 This entry was posted in 2011, Elizabeth Bullock, NOAA, NOAA Research, NOAA Teacher at Sea and tagged carbon dioxide, copepod, Elizabeth Bullock, liz, NOAA, NOAA Teacher at Sea, phytoplankton, R/V, Walton Smith. Bookmark the permalink. to answer your question on blog number 2: Water is comprised of two elements – hydrogen (H) and oxygen (O). Distilled water is pure and free of salts; thus it is a very poor conductor of electricity. By adding ordinary table salt (NaCl) to distilled water, it becomes an electrolyte solution, able to conduct electricity Ionic compounds such as salt water, conduct electricity when they dissolve in water. Ionic compounds consist of two or more ions that are held together by electrical attraction. One of the ions has a positive charge (called a “cation”) and the other has a negative charge (“anion”). Molecular compounds, such as water, are made of individual molecules that are bound together by shared electrons (covalent bonds). I went to GYLI camp in Connecticut, I got a chance to go on a boat and catch cool animals. It was really fun, and I got to meet new people who had the same interests as me. I got to see, touch, and catch creatures, that I didn’t even know existed, it was such a rush. I would like to ask you a question: Does the equator and where it is, or how hot or cold the water is due to the weather, affect the species that live in the different parts in the ocean? What animals live in cold water climates? I had a great time on that GYLI trip also! The temperature of the water definitely helps to determine the kind of species in any particular area. For example, in cold water, you would find organisms that have adapted to the climate by accumulating body fat or thick hair. Warm water species in the ocean tend to be smaller in size, with less body fat and less hair. They also don’t have a specific breeding season, because there isn’t a particular season with more food available than any other season. Electrical conductivity is the measurement of the water’s capability to conduct electricity. The EC varies from region to region, but higher EC is usually found in places with many rocks, especially limestone, which has more concentrated solution of dissolved carbonate minerals. The higher the amount of positively charged or negatively charged ions, the more conductive the body of water is. So, the more salt, then the higher EC. Here’s my question: What are some other ways that you can measure the things that you catch? Where else do you use displacement on the ship? 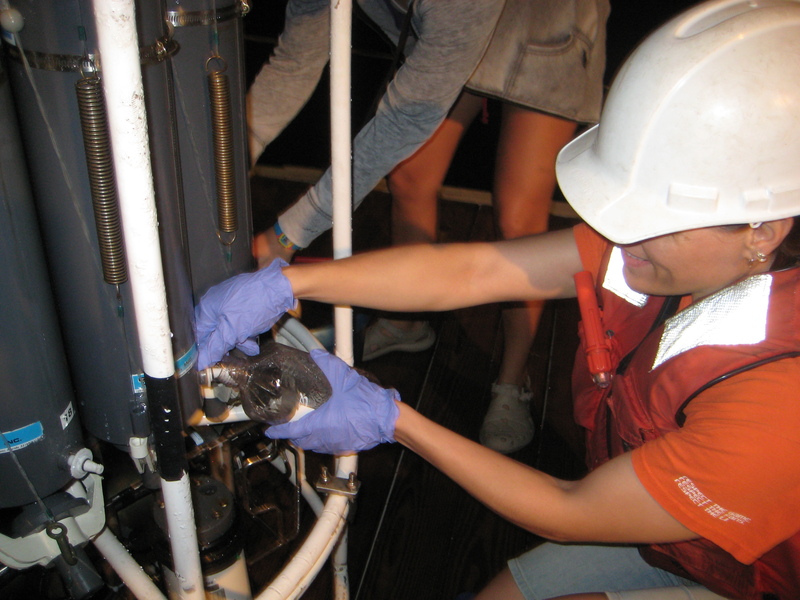 We use displacement on the ship to measure the weight of what we catch in the neutson net. 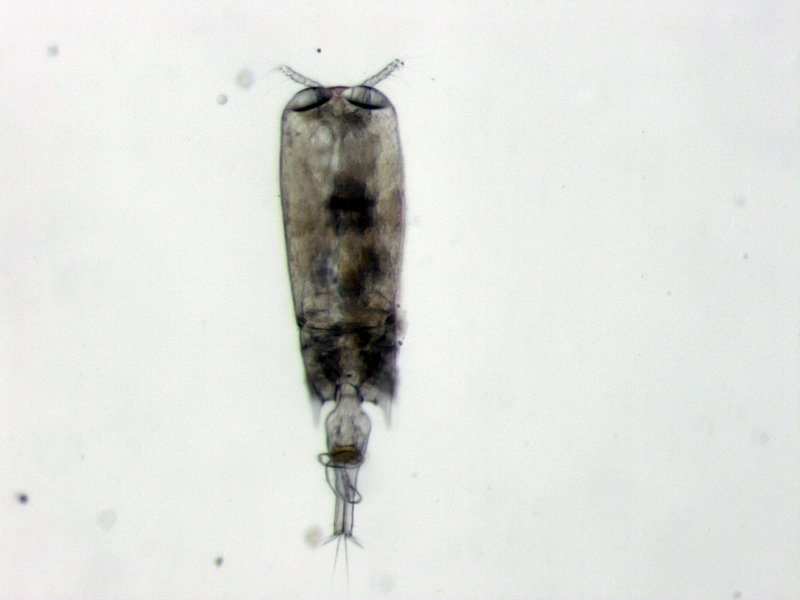 We can measure many different organisms this way, not just moon jellies. This is the only place we use displacement on the ship. We can also measure what we catch with a ruler. For example, we caught many different flying fish which varied from 5cm – 10cm.